Charles A. and Marjorie Estella Allred Greenland: Charles was the oldest son, second child of Nephi and Bertha (q.v.). He was born October 5, 1915, and married Marjorie February 18, 1940. Marjorie was born December 20, 1822. They had four sons, Charles A, Reid, Scott and Doug. They moved to Highland from Hiawatha, Utah in about 1952 and built #1 (Highland map - interactive, large) as a temporary residence, as they were planning to build a new home at #2 (Highland map - interactive, large) and use it as a garage. Their plans never materialized and the home still stands in 2018. They weren’t active in Church although Marjorie did attend occasionally, as did some of her children. Marjorie was close friends with Leah Wagstaff and Damie Carlson, who lived just over the border in Lehi. They lived here for 7-8 years then moved back to Carbon County. Charles died November 11, 1971, and Marjorie moved to Ogden where she passed away August 7, 2013. Their oldest son, Charles A., died in November, 2016. Charles Nephi and Bertha Hobbs Greenland: Neph, as Charles Nephi was always called, was the second son of the above Charles and Rachel, born October 25, 1888, and moved to Highland with his parents in 1906. Here he met Bertha Hobbs, daughter of William and Clara Hobbs who built and lived in #2. They were married June 28, 1911, and had three children: Flora Mae, Charles A. and Francis Lewis. After living in Highland a short time they moved to Carbon County where he continued to work in the mines. Nephi died April 18, 1960, and Bertha died January 12, 1971. Charles T and Rachel Potter Greenland: Charles T Greenland was born in Cwmcelyn, Aberystruth, Bedwelty, Monmouth-shire, Wales April 13, 1864, the sixth child of Henry Eates and Hester Ann Tapper Greenland. His father worked at various jobs, including agricultural laborer, hostler (one who takes care of the animals down in the mines), brickyard worker, iron worker and coal miner. They moved around a lot, which is evidenced by the fact that each of their children was born in a different place. Charlie began school at the age of three and went to work in the coal mines at the age of eight. His father would carry him on his back to work. A law was passed making it illegal to work in the mines until you were twelve, so he went back to school until he turned twelve. He was baptized into the LDS Church in 1872 at age 8. Charlie's family was baptized into the LDS Church in the early 1860’s and his father, Henry, came to Utah in 1881. He worked diligently and sent for Charlie and one sister in early 1882 and the remainder of the family came in late 1882 and they settled in Winter Quarters, Utah where Henry and his sons worked in the coal mines. In 1884 Charlie and some other miners went to Castle Valley to settle a town called Cleveland. He worked the main canal to get water to the town for irrigation and culinary purposes. He returned to Scofield in the fall but lived in Cleveland again in 1901. One of the pastimes of Charlie and his friends was to go to the train depot when the trains came in so they could see the new emigrants. One time they were there when the Potter family arrived and when he saw their daughter, Rachel; he told his friends, “she is the one for me”. They were married within a year or so. Rachel Potter was born February 1, 1864, the second child of Sampson Edgar and Sarah Chatterton Potter in Slackey Brow, Kersley, Farnworth, Bolton, Lancashire, England. Her family was quite mobile also, but didn’t move very far from her birthplace. She began working in a weaving factory at the age of nine. She was so small that they had to put her on a stool so she could reach the loom. She worked part-time and went to school part-time until she was thirteen then worked full time until she was twenty, when she came to America with her family. The Potter family was baptized into the LDS Church in 1879 and sailed to America in 1884, settling in Winter Quarters also. They crossed the plains by train and at more than one stop they heard fellow travelers remark, “there go some more wives for Brigham Young”. Charlie and Rachel were married December 2, 1885, traveling to Logan, Utah, about 250 miles in winter by horse and buggy. They then set up housekeeping in Winter Quarters. (ed. note: Winter Quarters is a short distance from Scofield and in the Scofield museum there is a hand-drawn map of Winter Quarters and one of the homes is identified as “Greenland”). They had two sons, John and Nephi, born in 1886 and 1888, then three daughters, Esther, Sarah Elizabeth and Edna, born in 1891, 1892 and 1895 that all died in infancy. They later had two more sons, Clarence and Henry and three more daughters Rachel, Gertrude and Mary who all survived to adulthood. In the 1900 census they are living in Winter Quarters and Charlie is listed as a “Weighman in Coal Mine”, their son John, 13, was a “messenger boy in store,” Nephi, 11, was “at school” and Clarence and Rachel were 3 and 1 years old. They had several encounters with Indians which scared Rachel, but nothing serious happened. One time (in 1901) she was bathing her baby (Gertrude) when an Indian woman appeared at her door wanting to see the white baby. After a few minutes of admiring the baby, she took her own baby from her back, held it out to Rachel and said, “trade, trade”, a word the Indians all knew. Rachel quickly and firmly told her no and sent her on her way. After the explosion in the mine, Charlie lost enthusiasm for mining and tried farming in areas of Emery and Carbon County (Cleveland and Pleasant Valley). Then in 1906, they moved to Highland and purchased thirty acres on the west side, where Freedom Elementary now stands and south from there to 10000 N, where he farmed and raised chickens, cows and pigs. There were two homes on the property, one where the Freedom Elementary school is (#9 on the 1958 Highland map) and the other at what would be approx 6730 W. 10133 N. (#3 on the 1958 Highland map), with barns, coops and stack yards across an irrigation ditch to the east of that home. Charlie and Rachel lived the remainder of their lives there. Charlie died in September 22, 1937, at age 73, and Rachel died July 19, 1945, age 81. They are buried in the American Fork City Cemetery. Charlie and Rachel were active in the LDS Church all their lives and participated in the Ward organization in 1915 and he was involved in the music-leading the choir, etc. Rachel worked mostly in the Primary Organization and also in Sunday School and Relief Society and they both sang in the choir and also sang duets. Six of their seven children have made Highland their home at one time or another. John, Nephi, Clarence, Rachel (Featherstone), Mary (Grace), and Henry all lived here for varying lengths of time, as have a number of their grandchildren (q.v.). Clarence and Maud Miller Greenland: Clarence was another son of the above Charles and Rachel - their third son, sixth child, and was born in Cleveland, Emery County, Utah on June 20, 1896. When he was ten his family move to Highland and he completed his schooling at the Highland school under tutelage of O. C. Day and others. He graduated in 1910 from the eighth grade. He was a good student and in his teens he substituted as a teacher for Mr. Day on a few occasions. Without any sisters in the family, he was called upon to do a lot of housework while his older brothers worked in the fields but got his turn there soon enough. Maud Miller was born September 23, 1901, in Lehi, Utah to Martin George and Emily Lavina Williams Miller (q.v.). Before her first birthday the family moved to Magrath, Alberta, Canada and lived there until 1910, when they moved to Mill Creek in Salt Lake County. Maud completed her schooling there at the North School and worked at ZCMI and at a candy factory before her family moved to Highland in 1918. Rachel told others that when she saw Maud she picked her to be a wife for Clarence, but those who know Clarence say that wasn’t so-he chose her himself. Maud was friends with his sisters, Gertrude and Rachel and it wasn’t long before they were going together and were married on October 27, 1920, in the Salt Lake Temple. Their reception was held in the Highland Church with music by Carter’s Orchestra. They moved into the home on the north half of his father’s property (#9 - Highland map - interactive, large) and had eleven children: Helen, Florence, Clarence Merrill, Richard G., Joseph M., Leonard T., Mildred, Charles T., Kenneth Lloyd, Maxine and Irene. 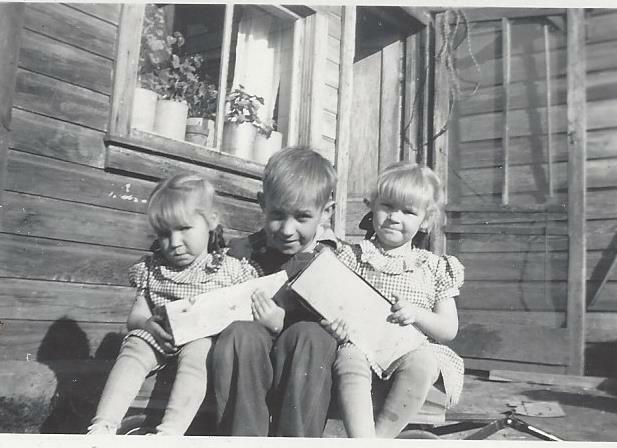 Mildred died as an infant, Kenneth died at four and one half and the last two were twins. Merrill served in the Army from January, 1945, until October, 1946, being overseas from Feb - Aug, 1946. Joseph served in the Air Force for 3 ½ years, ending in 1953 and Leonard served in the Air Force for 20 years beginning in 1952. Merrill, Richard and Charlie served Church missions - Merrill to the Southern States from 1947 - 49, Richard to the Western Canadian from 1949 - 51 and Charlie to the Canadian from 1960 - 62, serving under Thomas S. Monson. Clarence served as assistant secretary for the Sunday School when just thirteen, then a year later he became secretary for four years then was released for a year and when the Ward was organized in 1915 he again was Sunday School Secretary for five years, then treasurer for two years, then in the Superintendency for eight years, until 1930. In the meantime he became Ward Clerk in February, 1919 and held that position until February, 1956. Maud served as counselor in the Primary to her mother-in-law, Rachel and later served as President. She also served as secretary of the genealogy committee, Relief Society secretary for many years and as Relief Society president for one year in 1949 with Otes Day and Ruby Day as counselors and Jessie Hyde as secretary. In addition to farming, including a lot of labor sharing with neighbor farmers, Clarence worked at various other pursuits, including the sugar factory every year for more than thirty-five years, beginning at the Lehi factory and continuing at West Jordan. He was Water Master for Deer Creek water from the Murdock Canal and cleaned the canal every spring, along with the ditches for which he was Water Master: Harmon, Cedar Hollow, Gray and Progressive. He also worked at a foundry in Provo for a time. When Rachel died in July, 1945, Clarence moved his family to her home on the south half of the property (#3 - Highland map - interactive, large), with the assumption that he would buy the farm and stay there. It was not to be as his siblings sold it at a higher price than he could pay so he was forced to move. He used his inheritance to buy three plus acres from Elizabeth Day, whose husband, Louis had recently passed away, then, while building his home he lived in the Harmon home (#12 - Highland map - interactive, large) with the Wagstaff family who had just purchased it, then rented from his brother Nephi for a while (#2 - Highland map - interactive, large), finally moving into his new home (#11 - Highland map - interactive, large) in March, 1948. Clarence lived only a short time after his release from the Ward Clerk position. He died June 4, 1957. Maud continued to live in their home until 1974 when she went to live with some of her children in turn and she passed away December 28, 1978, at the home of her son, Richard in American Fork. They are both buried in the Lehi City Cemetery, next to their two children and Maud’s parents. Francis Lewis and Simone Marthe Elise Clavel Greenland: Francis was the third child of the above Nephi and Bertha, born February 20, 1917. Simone was born March 3, 1921, and they were married November 16, 1939. They were parents of two boys, Francis Jr and Rex. They moved to Highland (#2 on the 1958 Highland map) about the same time as his brother and lived here only a short time. Francis died July 21, 1975, and Simone died September 19, 2000. Henry Edgar and Marie Vera Larson Greenland: Henry was the tenth child, fourth son of the above Charles and Rachel. He was born on February 19, 1909, their only child to be born in Highland. When he was about five, his two-year-old nephew, William John Greenland, Jr., came to live with the family when his mother died. Marie was the daughter of Ludvig Maurice and Vera Marie Featherstone Larson, the closest neighbor to the Greenlands. Marie was born October 4, 1917, in American Fork and they were married August 9, 1934. They had three children: Barbara Marie, Edgar Bruce and Henry Eugene, all born in Highland. In 1947, when Eugene was four he became very ill and had to spend time in the Primary Children’s Hospital. His parents spent most of their time with him while the two older children lived with the Larsons. One day Henry came home to take an irrigation turn and built a fire in their home and went to the field to work. A bit later he saw his house (#83 - Highland map - interactive, large) on fire-they lost almost everything they had. They found some Army barracks available for sale in Kearns and moved two of them onto their property and lived there (#84 - Highland map - interactive, large) for more than a year while they rebuilt their home. Their new home was moved in from elsewhere and veneered with brick and still stands (2018) as does one of the barracks buildings. Marie was very active in music and drama in the Highland Ward, wrote and directed many plays and roadshows and was a talented musician. She served as Relief Society president for two years from 1952 - 54 with Kate Rogers and Verda Jepperson as counselors and Maud Greenland as secretary. Henry worked for Utah Power and Light and in the early 50’s was transferred to Castle Gate, Utah. He died October 27, 1971. Marie later married Tom Bendall in December, 1982. Tom died in 1985 and she died October 11, 2002. Richard G. and Darleen Ann Bunker Greenland: Richard was born April 19, 1929, in Highland to Clarence and Maud Miller Greenland (q.v. ), the fourth child, second son of their eleven children. He attended Harrington Elementary and American Fork High School, graduating in 1947. During his schooling he worked in the lunch room to help pay for his lunch. In 1944 he began working for Yukus Inouye after school and in the summers and by the spring of 1949 was able to pay for his mission to Western Canada. His farewell was held the same day as the homecoming of his brother, Merrill. Darleen was born July 4, 1932, in Salt Lake City, Utah to Edward McQuarrie and Marguerite Annie Hyde Bunker (q.v. ), the third of eight children. She lived her early years in Soda Springs and Conda, Idaho then moved to Highland when she was nine. She went to Harrington and American Fork High, playing the clarinet in the band under K.J. Bird. She graduated in 1950 and went to BYU for two years while working at the BYU book store. She loved 4-H and participated in it for many years, winning honors in sewing, cooking and record keeping. She and Richard were married November 21, 1951, in the Salt Lake Temple. Carter’s Orchestra played at their wedding reception, as they did for his parent’s wedding thirty one years earlier. They spent many years involved in MIA as dance directors and leaders. They taught floorshow dances for Gold and Green Balls before they were married. They had eight children: Aileen, Richard Jr., Roy, Cynthia, Kenneth, Douglas, Tammie and Robert. Richard worked as a dairy farm manager in Provo for 3 years and in Meridian, Idaho for two years. In 1964 they bought a home on east Main in American Fork and he worked as stock manager for Ream’s Grocery for over twenty-one years. He later worked for Word Perfect. After many years of heart problems, Darleen succumbed on December 5, 2006. Richard continued to live in their home by himself and passed away April 17, 2012, two days before his eighty-third birthday. Both are buried in American Fork cemetery. William John and Cressie Althera Loveridge Greenland: The eldest of the children of Charles and Rachel Greenland, John was born October 6, 1886, in Winter Quarters, Utah Territory. He moved with his family to Highland in 1906, where he met Katherine Strasburg, daughter of Louis Henry and Fredericka Honeck Strasburg (q.v.). She was born September 23, 1892, and was living in Highland with her parents. They were married November 15, 1911 and made their home in Mohrland, Utah where their two children, John Jr. and Lois were born. Katherine died September 22, 1914, ten days after giving birth to Lois. After her death John returned to Highland and his children were raised by their grandparents - Lois by the Strasburg’s and John Jr. by the Greenland’s. Seven years later, John married another Highland girl, Cressie, daughter of William and Martha Creswell Loveridge and shortly after, he left on a mission to the Northwestern States. Upon his return his father-in-law helped him get started in the service station business with a Shell station on the corner of the Alpine Highway and the Canyon Road (#56 - Highland map - interactive, large). They had four children: Vernon, Martha, Hubert and Dan and they all lived in a two room home adjacent to the station. John’s station was well-known as it was the only one for many miles. It was notable for its clear glass cylinder on top of the pump, with markings for gallons. Pushing the pump handle back and forth pumped the gas out of the underground tank until the amount of the purchase was in the cylinder then it flowed by gravity into the car. John also fixed flat tires and sold candy, snacks and soda - a regular 7-11 store but with hours more like 6 - 10. John had a dog for many years at the station and he told people that it was a carpenter dog (did odd jobs around the house) or a blacksmith dog (kick him in the a** and he’ll make a bolt for the door). John served as chorister and choir director and in the Sunday School Superintendency. He was troubled with asthma and sometimes had trouble breathing but he also served several years as Justice of the Peace for Highland. Cressie worked in the Relief Society and wrote news articles for the local papers: Provo Herald and American Fork Citizen. She also worked for the State Training School for thirteen years. Eventually John’s asthma got so bad he couldn’t operate the store any longer so sold it and bought a home in Lehi. He died January 28, 1962, and Cressie eventually sold and went to live with her children. She died September 24, 1988, in Orem, Utah.